PT Pembangunan Perumahan (Persero) Tbk - PT PP or referred to as "PT PP (Persero) Tbk" is one of the largest state-owned construction companies in Indonesia. 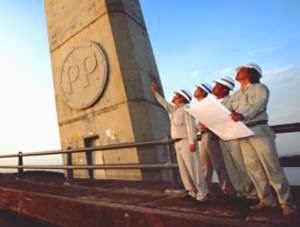 PT PP was formed in 1953 and has strong reputation in Indonesia for more than 60 years in the field of construction of prestigious building, infrastructure, property and Engineering, Procurement and Construction (EPC). PT PP is owned majorly by the Government of Indonesia with 51% shares and the rest is owned by PT PP Employees Shareholders Cooperative (KKPSPP) with 4.01% shares and the public with 33,45% shares. Headquartered in Jakarta, PT PP now has 5 key subsidiaries; PT PP Dirganeka (99.999% owned by PTPP), PT PP Pracetak (99.999%), PT Gitanusa Sarana Niaga (99.99%), PT PP Alkon (99.98%), and PT PP Properti Tbk (99.9%). In term of financial positions, PT PP reached significant performance in 2015. PT Pembangunan Perumahan (Persero) Tbk recorded total operating revenue of Rp 14,217.37 billion in 2015 or an increase of 14.40% year-on-year (yoy) from Rp 12,427.37 billion in 2014. Total comprehensive income in 2015 amounted to Rp 845.56 billion. These total comprehensive profit figures equivalent with a 58.49% growth as compared with Rp 533.52 in 2014, according to PT PP - Financial Highlight 2015 as quoted by JobsCDC.com. Have a minimum of 2 years of work experience in the field of SAP. Excellent English language skills (active and passive). Technical expertise in the field of SAP Basis for S / 4 HANA. Expertise with server and familiar with windows server and linux. Expertise with SAP ABAP programming language. Willing to be placed in all areas of operation of PT PP (Persero) Tbk. Have a minimum of 2 years of work experience in the field of Networking. Technical expertise in the field of IT Security, IT Service Continuity and IT Risk Management. JobsCDC.com now available on android device. Download now on Google Play here. Please be aware of recruitment fraud. The entire stage of this selection process is free of charge. PT Pembangunan Perumahan (Persero) Tbk - Management Trainee Program PT PP September 2016 will never ask for fees or upfront payments for any purposes during the recruitment process such as transportation and accommodation.